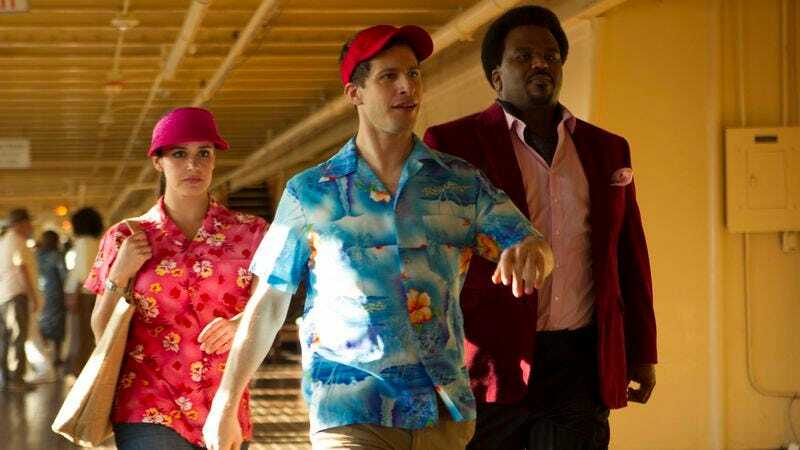 Brooklyn Nine-Nine is a solid show that can make the biggest stories out of the smallest plots, but the show can really thrive when it goes high concept. It’s a show where the protagonist gets all of his inspiration from stereotypical old school cops and Die Hard, after all. The humor is still there, as are the character moments—everything else is just bigger. If nothing else, Brooklyn Nine-Nine’s third season appears to understand that, so now after going Die Hard with “Yippie Kayak,” the show goes Speed 2: Cruise Control (also known as Die Hard On A Boat). Sort of. Really, it just goes for the location of Speed 2 in order to go for the trilogy with the return of the Pontiac Bandit, Doug Judy (Craig Robinson). Craig Robinson is a funny, charismatic actor who hasn’t found the right starring vehicle for himself yet. So until he does, I more than welcome him in things like the Pontiac Bandit episodes of Brooklyn Nine-Nine. Like the Halloween episodes, the Pontiac Bandit episodes are pretty much the most “obvious” episodes of the season. We know Jake is going to bond with Doug Judy, despite all of his moral protestations. We know Doug Judy is going to get away from Jake before he can get arrested. We know that any of the supporting characters in the world of Doug Judy are going to be barley drawn caricatures. But we also know that the in between is going to be pretty damn fun, and that doesn’t change in “The Cruise.” Plus, hearing that smooth voice sing about Rosa and talk about “smooshing” just feels right. Honestly, “The Cruise” is a good episode as a whole, but it’s also one that feels at times like it’s trying to rekindle the magic of the superior, previous two installments of the trilogy. Look no further than the “Pina Colada Scene.” However, it doesn’t need to do that, especially when it clearly knows it’s not (and doesn’t present itself as) an actual conclusion to the story. It’s all still funny and delightful—just less so than before—and Doug Judy lives to scheme another day as the audience is left wanting more. That’s enough for now. It’s all in the aftermath of the word “smoosh” being used way too many times and an assassin trying to kill a fugitive, but just mood-setting for a couple like Amy and Jake. Doug may be a criminal, but he knows how to bring people together. Interestingly enough, the decision to have Kevin go off to Paris has led to Brooklyn Nine-Nine going forward with paying more attention to Holt’s personal life, and so far, so good. Unlike last week, when the Nine-Nine realized that something was wrong with Holt and Jake tried to remedy it, “The Cruise” instead brings in a family member who also has a lot going on in her life and finds a way for Holt to eventually connect with her and tap into his emotions. He maybe be a robot, but he’s not made of stone, you know? Plus, Holt’s seltzer habit is one of the most brilliantly Holt ways to deal with stress, and his attempt to follow Gina’s advice to “fight drama with drama” manages to be both the most hilarious and honest moment of the plot (and perhaps episode of a whole). No, not the “Mercury in retrograde” stuff but the way “Valley Girl” Holt talks about how he basically pushed Kevin to go and now feels alone; it really hits you when you think about it. The fort is the icing on the emotional cake, and it’s nice that it ends the plot with brother and sister finally speaking the same language. Just like the boyfriend and girlfriend plot does, actually. Paul F. Tompkins playing the boat captain is perfect, since Paul F. Tompkins is basically the boat captain of all of our hearts. At least, he should be. I absolutely love Amy, but from what we see of her itinerary, she just wants to turn her relationship with Jake into one of an old married couple (or of old widows). Jake’s shrimp plan is also unromantic, but in a much different way. Given that we never really learned anything about Marcus, do we know if Debbie and that cheating Gary are his parents? The next Pontiac Bandit episode has to have jealous Boyle and Doug interactions, right? You can’t have two best friends when one of them is a fugitive of the law, Jake. You have to decide. 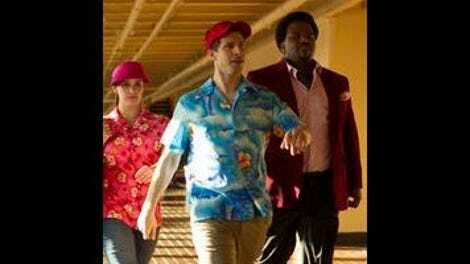 Doug Judy (re: Speed 2: Cruise Control): “Great movie. Sandra Bullock in a sarong.” He and Jake then fist bump, and we all see Amy’s life flash before her eyes. Doug Judy: “I can’t go to jail. I’m too cool!” Too true.